Blend the cereal until it becomes a powder and then add two eggs, garlic, and tumeric. Puree the cauliflower. When It cools add it to the mixture. 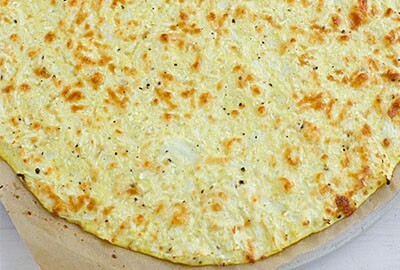 Put the mixture on a pizza plate and cook in the oven at 375F for approximately 20 minutes. Add your favorite Phase 1 Veggies and toppngs!